The U-E Boys Track team won its first invitational of the year this past weekend in Windsor. 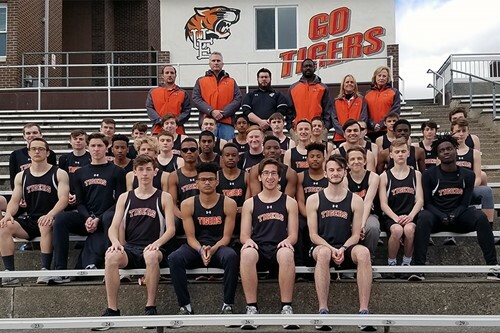 The NY/PA Invitational had 25 teams from both states and the Tigers won with a score of 83 points with Norwich finishing second with 66 points. Ese Amata won the high jump at 6’02” and finished third in the 400m hurdles. Ethan Armstrong placed third in the high jump. Aaron Davis won the long Jump at 21’05.25”, won the 200m dash in 23.04 seconds, and won the 100m dash in 11.72 seconds. Nyrese Harte-Gray placed second in the 110m hurdles. The 1600m relay team (KG Graham, Ese Amata, Dandre James and Nyrese Harte-Gray ) finished second. The 400m relay team (Zymir Mobley, Nyrese Harte-Gray, Jayshawn Favor and Aaron Davis) placed first with a time of 44:26 seconds.